While the Windows, Android and iOS versions are offered for download on wps.com, operated by Kingsoft, a Chinese software company, the Linux version has a separate website (wps-community), and appears to have different developers: "WPS Community team is a small group working to develop the Linux edition of WPS Office". WPS Office 11.1.0.8372 (2019) for Linux includes support for high resolution screens, and customizable appearance. 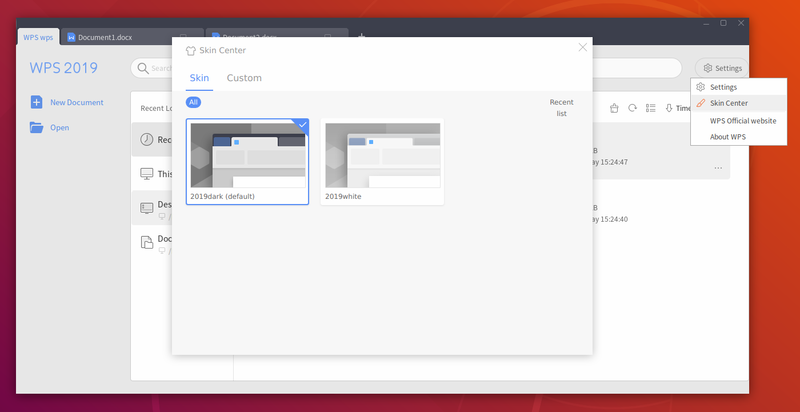 From the application settings you can currently choose from 2 skins (2019dark and 2019white), or customize the WPS Office appearance by specifying your own custom background color, image and font size. Also, with the addition of skins, the WPS Office default icons changed in this release. The new WPS Office start screen displays a list of recently used files and pinned locations, with a built-in file browser for quick documents access. It also has a WPS Cloud documents search feature which doesn't appear to be working, I'm presuming because it's tailored at Chinese users. This release also adds support for multi-window tab management. In the previous versions, all documents opened from a WPS Office window would open in a new tab in the same window, with no way of moving a document to a new window (other than opening a new WPS Office instance, then opening the document in that new window). With the latest WPS Office, it's now possible to drag a tab from an existing window to create a new window, and move tabs between WPS Office windows. This only works with tabs of the same application (WPS Presentation, Spreadsheets or Presentation). 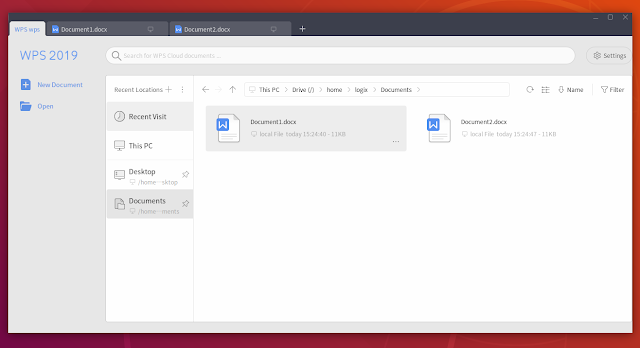 The WPS Office blog mentions the ability to combine tabs from Presentation, Writer and Spreadsheets with WPS Office 2019 for Windows, but this does not work for me, so I assume this feature was not introduced in the Linux version. The integrated PDF tools mentioned in the WPS Office 2019 for Windows blog post aren't available in the Linux version either. WPS Writer: New Reading View (accessible from the WPS Writer statusbar) which displays the document content book-style, with columns. This mode doesn't allow editing, other than highlighting text, and it includes TOC navigation. The full changelog is available on wps-community.org. To download WPS Office, head to its downloads page. Only DEB and RPM packages can be downloaded. The download speed from wps-community.org was very slow for me, so I searched for a mirror and found this (click the blue button at the top, then click on the WPS Office DEB or RPM package to download). 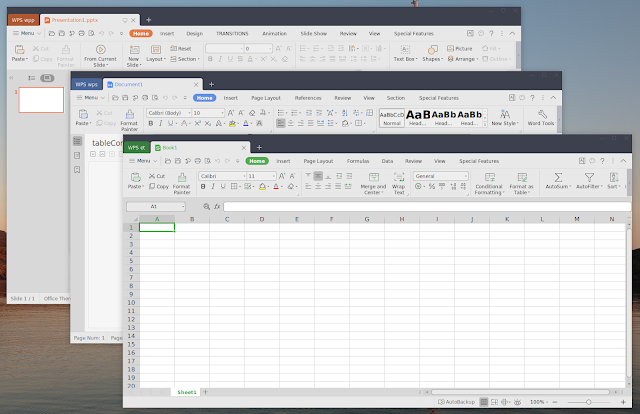 WPS Office is also available on Flathub, so it can be installed on a large number of Linux distributions. To install WPS Office from Flathub, you'll need to install Flatpak and add the Flathub repository. You can find instructions for how to do this on the Flathub quick setup page. After setting up Flatpak and Flathub, head to the WPS Office Flathub page and click the install button. If you're a Gnome user, you can also search for it on Gnome Software / Ubuntu Software and install it from there. In my case, WPS Office 11 (2019) installed from DEB packages does not start on Ubuntu 18.10 (I had no problems on Ubuntu 18.04). The Flatpak package, which was already updated to the latest WPS Office 11 (2019) version, works with a minor issue: the application crashes when clicking on the Skin Center option, I'm guessing because it tries to access some online server, and this Flatpak package doesn't have permissions for that.